Click image to see much larger version. ToxicMom's Sculpting Studio has released this "in progress" image of Beetlejuice, which is the first action figure in the Frequency Challenged line they are working on with Fighting Amish Toys. In this case, "in progress" means that the figure is still in "stage one" of the sculpting process. Following stages include silicone molding in order to create a wax copy to finalize details and articulation. 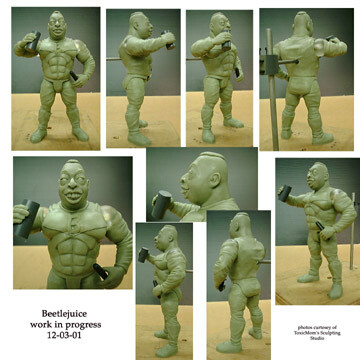 Beetlejuice will have 12 points of articulation, and will come with a cloth cape, a microphone, a beer can, and an oversized pair of headphones. He will come in two versions: one will feature the head sculpt shown above with blond hair and the other will feature a different facial expression and black hair. Special Note: ToxicMom's Sculpting Studio is considering adding a voice chip to this figure. It would likely consist of ten phrases of about seven seconds each. If you don't listen to Howard Stern: visit Jollydwarf.com to learn who Beetlejuice is.